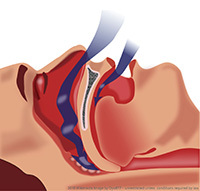 Hypoglossal nerve stimulation is used in obstructive sleep apnea. Stimulating the genioglossus muscle in the upper airway makes it contract, which widens the airway. The stimulation is applied during sleep in order to increase airflow. Neurostimulation is reserved for patients who have trouble tolerating the standard obstructive sleep apnea treatment, a sleep mask that provides continuous positive airway pressure.